Scalloped potatoes are creamy, flavorful, and perfect for any special meal, whether it's a birthday dinner or a holiday celebration. Although it seems like they're a lot of work to make, particularly for a humble side dish, scalloped potatoes are actually quite simple. Although this particular recipe doesn't call for cheese, it's an easy—and decadent—addition when sprinkled over the potatoes at the end of the baking process. Generously butter a 2-quart baking dish. In a deep skillet or saute pan, cook the bacon until just crisp. Remove it to paper towels and set aside to drain. Leave about 2 tablespoons of bacon drippings in the skillet and add 3 tablespoons of butter. Add the onion to the pan and saute until softened. Add the flour and continue cooking, stirring, for about 1 minute. Gradually stir in the milk. Cook, stirring constantly, until the sauce is thickened. Stir in the salt, pepper, and nutmeg, if using. Stir in the cooked bacon. Layer half of the potato slices in the prepared baking dish. Spoon half of the sauce mixture over the potatoes. Top with the remaining potatoes. Spoon the remaining sauce over all. Cover the casserole tightly with foil and bake for 1 hour. Remove the foil, return to the oven, and bake for about 20 to 30 minutes longer, or until the potato slices are fork-tender. Potatoes should be sliced very thinly for scalloped potatoes. Use a mandolin if you have one available, but take care not to cut your fingers while slicing. Hasten the cooking process is to first cook the sliced potatoes in simmering water or milk for about 2 to 3 minutes. Red-skinned or Yukon Gold potatoes are good choices because they hold their shape better than higher-starch baking potatoes such as Russets. For a bit of garlic flavor, rub the cut side of a sliced clove of garlic over the bottom and up the sides of the baking dish before buttering. Make the potatoes ahead of time by baking them as directed, cooling the potatoes to room temperature, and storing them in the fridge in an airtight container. When you want to serve the potatoes, bake them covered with foil at 350 degrees F until they're heated through, which should take about 30 minutes. Add 1 cup of shredded cheddar cheese to the sauce or top the casserole with the cheese when the potatoes are tender and almost done. Continue baking until the cheese has melted. 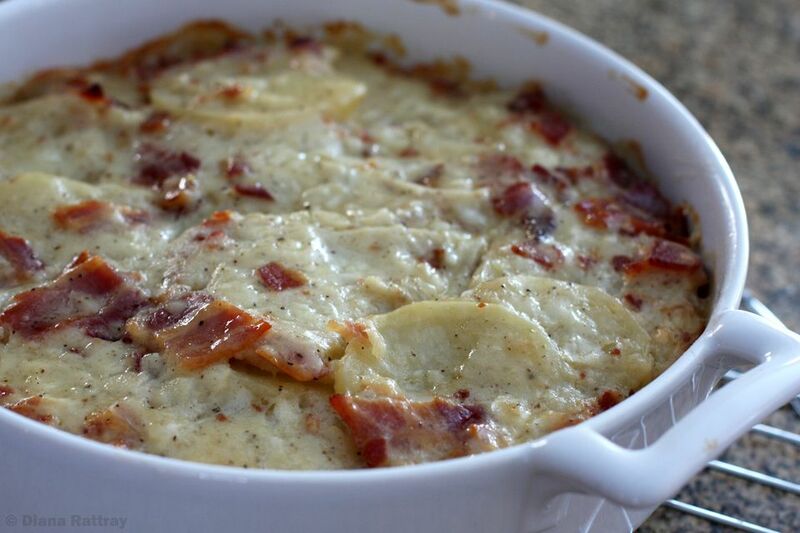 Make scalloped potatoes in the slow cooker by lining the bottom of the cooker with sliced potatoes. Whisk the milk and flour in a small bowl, and then pour it over the top of the potatoes. Add the remaining ingredients and set the slow cooker to low for 5 hours. Remove the lid and let the dish rest for 30 minutes to let the sauce thicken naturally.